(CNN) -- A rail car filled with liquefied petroleum gas exploded and started a fire in a residential neighborhood in the Italian seaside town of Viareggio, killing at least 14 people and collapsing about a dozen homes and buildings, authorities said Tuesday. Firefighters check a wrecked freight train in Italy after gas tankers exploded. The explosion happened just before midnight Monday when a tanker in a 14-car cargo train sprung a leak and derailed, spilling its hazardous liquid into the streets and alongside buildings. Four other tank cars also left the track and overturned, leaving nine upright, authorities said. Two children were among those severely burned, said Guido Bertolaso, head of Italy's Civil Protection Agency. Many residents were asleep at the time of the blast. At least 36 people were injured, most of them burned. Among those, 16 were in critical condition. Four people were reported missing. "It was a terrifying scene which I will never forget," added the witness, who works at a nearby pharmaceutical company. "We couldn't do anything for the body except cover it up." Another witness said a young girl riding by on a scooter was caught in the blast, and threw herself on the ground to put out her burning clothes. Italian Prime Minister Silvio Berlusconi planned to visit Viareggio later Tuesday. Firefighters could be seen trudging through high piles of smoking rubble. The husks of charred cars lined narrow streets. "If someone thinks that the danger phase is over, it is not so," Bertolaso said. "The search and rescue operations are not over and will not be over before this evening," Bertolaso said. Not all the victims have been identified, because of their severe burns. The train, which was hauling nine tanker cars through a station, was traveling from La Spezia to Pisa, Antonio Garufi, a local government official, said. Minister of Transportation Altero Matteoli opened an investigation into the accident. He said he wants to see whether any rules for the safe transportation of dangerous cargo were breached, or whether there are insufficient regulations. Matteoli will present a report on the findings to the Italian parliament. Mauro Moretti, chairman of Italian Railways, told television media Tuesday that one of the wagon locks may have malfunctioned. He said the train conductor didn't appear at fault. He was driving the train at the average speed of 90 kilometers per hour, Moretti said. Francesco Tardini, an assistant to Viareggio's mayor, said she was at home with her family when the incident occurred. "First I heard three explosions and then I saw the fire and the big flames," she said, adding that she could see the fire from her home, which is 6 kilometers (3.7 miles) from the train station. 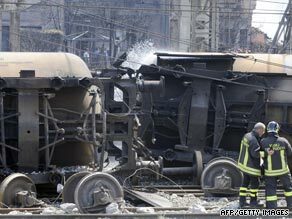 Authorities have called the accident one of Italy's worst rail tragedies. CNN's Hada Messia in Rome contributed to this report.